Perez might have the advantage in fWAR, but Gomes is a much better pitch framer than Perez. That more than makes up any disparity. I think it's surprising to see him tabbed as the best catcher in the American League, but he's hit well and played fantastic defense, even before considering the framing. 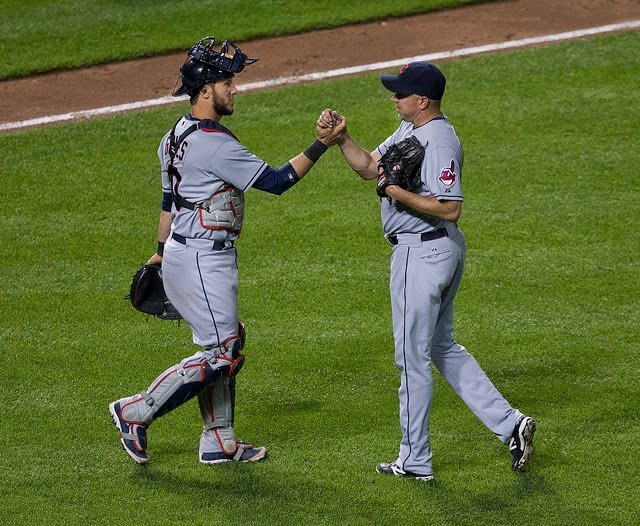 He's also supplanted last year's reserve AL Catcher, Carlos Santana, on the Cleveland Indians. Perez's offensive prowess, however, still gets him on the all star team. Miguel Cabrera isn't having a great year, by his standards. But he's still got a .390 wOBA. And he was freaking amazing last year. Edwin Encarnacion is a long warm-fuzzy player for me, and it's thrilling to see him doing so well. I really wanted to take Dozier over Cano, because I love the underdog. But Cano has just been too good, with nearly a full win lead over him despite 60 fewer PA's. Dozier has the power, but Cano is the better hitter. Still, it's neat to have him on this list. I still don't think I've completely grasped how good Josh Donaldson is. We all expected a pretty big regression this year. And he has definitely regressed, losing nearly 40 points off his wOBA. But he's still an above-average hitter and a borderline elite fielder at the hot corner. Sounds a lot like what Adrian Beltre has been throughout most of his career. It seems to me that Alexei Ramirez gets very little respect for what he has done. He's a very aggressive hitter, which probably reduces his nerd love a bit. But he makes enough contact that he can still get on base at a fair clip, has decent power for a shortstop (even if not what he once had), and posted 3-4 win seasons in three of the prior four seasons, and is on pace for 3 WAR again this year. He's not great. But in a crop of AL shortstops that currently has no clear standouts, he might be the best performer over the past year. Elvis is right there, of course, as is Erick Aybar (not listed). Mike Trout is the best player in baseball, same as last year. But man, Alex Gordon rates well. Most of that is fielding, but he ranked 2nd in the AL last year as well. I gave Bautista the nod over Jones for the last starting spot, mostly because I love the OBP machine he has become...and Trout can cover center field. Edwin is our reserve first baseman, but I'm giving him the nod here over Victor Martinez as the best available offensive player who hasn't yet earned a starting job. Edwin's had a pretty improbable career. I always thought he would be a good hitter, but I never anticipated that he'd produce the kind of power he has. The move from third base has been a major boon to his value. He's quite fortunately hit well enough--easily well enough--to justify the position shift, and he's only a few clicks below average over there. King Felix is just so good. I remember a time when we (or I, at least) was worried he might be starting to slip. Nope! He's 28 years old, in his 10th season, and has compiled 46 fWAR in his career already. Hall of fame, right? Koji! Also of note, I think, is Sean Doolittle, who has been especially ridiculous for the A's this year (13 k/9, 0.5 bb/9...that's lol'able). It was between Keuchel and Jose Altuve. As much as I love Altuve, Keuchel has been a revelation this year: he's become this unreal ground-ball machine (63% GB%) who walks no one (2.3 bb/9), while getting respectable strikeout rates. While I try to avoid overreacting to small samples, Keuchel's xFIP wasn't that far off from where it is this year. It's just that this season, he's getting much better results. I'd love to see him make the team, even if he's a far cry from the track recover of the other starting pitchers.